Yesterday, I told you all about the amazing gyros that my Chief Culinary Consultant and I used to get when he was living outside of D.C. Since he moved back two years ago, we have been in a serious gyro drought. Thank the gyro gods that the house we bought is located only about five minutes from a fabulous gyro joint here in Pittsburgh. In the meantime, however, I’ve been dreaming about making gyros at home. 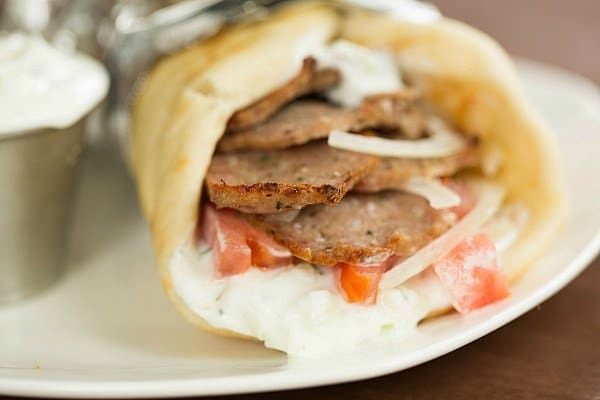 Gyros are one of those things that just seem… impossible to make at home, right? Sort of like pop-tarts. As I’ve come to learn, however, nothing is impossible in the kitchen. These gyros are proof in the pudding… they were not very difficult to make, and are every bit as good (better, even) than our favorites from Greek and Middle Eastern take out joints. While traditional gyro meat is cooked on a vertical spit and then shaved off, that’s not exactly practical in a home kitchen. In order to get those thin strips of meat cooked to the correct consistency, it’s actually baked twice. 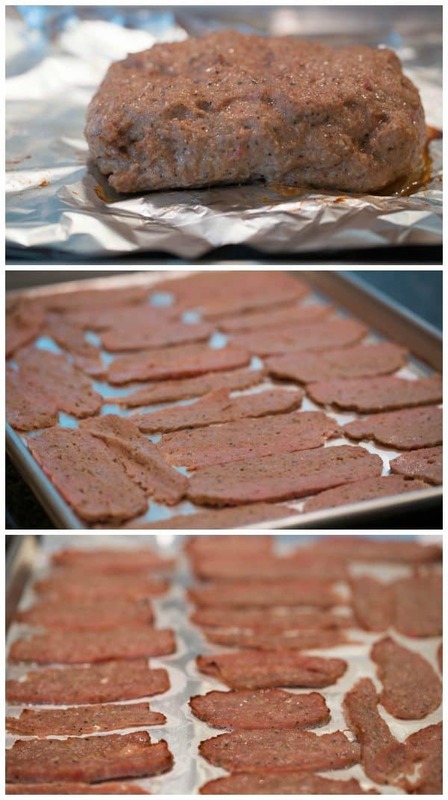 A combination of ground lamb, seasonings, onion, garlic and slab bacon are processed together to form a cohesive mass. The mixture is shaped into a meatloaf, for lack of a better word, and baked at a low temperature. Once given time to sit, very thin strips of meat are sliced off, then laid in a pan and broiled for a couple of minutes. I was seriously stunned at how similar this meat tasted to the gyro meat that I have been accustomed to. It has so much flavor and the texture is just perfect. When serving gyros, you want to look for pocketless pita bread, which can also be referred to as “hand-pulled”. Naan or flatbread can also work in a pinch. Then, pile on the meat, tzatziki sauce, chopped tomatoes and thinly sliced onion. Wrap it all up and then dig in. Don’t forget some extra tzatziki sauce on the side; you can never have enough of that awesomeness. I love being proven wrong when I think a certain type of food is beyond being made at home. Who am I kidding? Everything can be made at home, and it’s usually better than you can get elsewhere. These gyros are no exception. A recipe for making lamb gyro meat at home. It's easy and tastes like some of my favorite take-out places! Make the Gyro Meat: In a medium bowl, combine the ground lamb, salt, pepper and oregano leaves with your hands, mixing until all of the seasonings have been evenly distributed. Cover and refrigerate for at least 1 hour, or overnight. Preheat oven to 300 degrees F. Place the lamb mixture in the bowl of a food processor and add the onion, garlic and bacon. Process until a smooth puree is formed, 30 seconds to 1 minute, scraping down the sides of the bowl as necessary. Line a rimmed baking sheet with aluminum foil. With moistened hands, shape the lamb mixture into a rectangle about 8 inches long and 5 inches wide. Bake until the center of the loaf reaches 155 degrees F on an instant-read thermometer, 30 to 35 minutes. Remove from the oven and allow to rest for 15 minutes. Adjust the oven rack to the highest position (1½ to 2 inches below broiler element) and preheat broiler. Slice the loaf of lamb meat crosswise into very thin pieces (they should be about ⅛-inch thick; no more than ¼-inch thick). Lay the strips on a rimmed baking sheet lined with aluminum foil and broil until edges are browned and crispy, 2 to 4 minutes. (I did this in two batches, as I couldn't fit all of the sliced meat on one baking sheet.) Be sure to keep an eye on it, as the broiler works quickly! 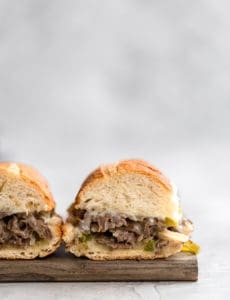 Serve the Gyros: Warm up the bread either in the microwave (30 seconds), on the stovetop or in the oven. Top each with ¼ cup of tzatziki sauce, chopped tomatoes, sliced onions and gyro meat. Wrap with foil and serve. I have been looking for a good gyro recipe and can finally stop looking! This was delicious and a hit with the family and the toddlers as well! Thank you for sharing! DELICIOUS!! I will never have to go out to eat to eat a gyro again!! a very shape knife to cut into slices. I can’t believe how great these were. In 2017, I had saved your recipe and then went searching for ground lamb. Only 1 supermarket (upscale) sold it and they wanted $10.99 for a lb. of ground lamb. Wow! I decided to forgo my craving. So, this year, I’ll bite the bullet and go for it. Hopefully, it is not just a seasonal item (spring). 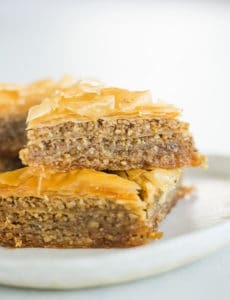 Your recipe makes quite a few slices so it would be more economical than purchasing gyros from the only place in this small town which has them on their menu. I havent made this yet, but I look forward to it It is still winter here…no fresh oregano. What is a good substitute with dried oregano? I have both mexican and traditional. Or..would dried ruin this recipe? I haven’t used dried, but you generally want to use 1/3 the amount, as it’s more concentrated, so you could do 2 teaspoons of dried oregano. The absolute best!!!! I’m not one for lamb, but my husband & i LOVE this recipe!!! It will most DEFINITELY become a regular dinner around here!! My husband couldn’t stop talking about how good it was!!! TY!! TY!!! I made this tonight and I was not disappointed! Thanks for posting such a great recipe. I served this with some homemade naan bread, tzatziki sauce, tomatoes and feta cheese. Will definitely make again. I am a big time lover of gyros. And lately I’ve been on a big gyros kick. I’ve been getting them from all over. Different restaurants, different cities – even frozen. So, Right now my pallet is pretty honed to what constitutes a good gyro. I just ate some of this about 30 minutes ago and – wow! My expectations where not high given the simplicity of the recipe, but this tasted extraordinarily close to a decent restaurant gyros. 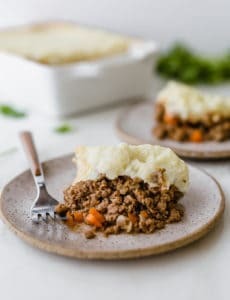 I think adding a half pound of ground beef to cut down on the gameness of the lamb and adding more onion, garlic, spices accordingly would probably make this perfect. I’m going to keep this recipe around and play with it to my liking but, even as is, it is fantastic. Letting it cool down to cut was so hard. It smelled and tasted great, I kept going back to the kitchen to sample it. Bravo! These were #$%&ing delicous. And before you ask, yes that expletive was necessary cause they are that good and super easy to make. Best recipe for Gyro and tzatziki sauce!